[2015 Feb] Feds award family $7.4 million over disabling vaccines On June 22, 2011, Carolyn Schutte went to the Clay County Public Health Center in Liberty for a round of shots. She was preparing for a trip to Africa and received vaccinations for various diseases, including tetanus, Hepatitis A and B, and typhoid. Two days later, she was debilitated with permanent brain damage caused by encephalopathy. "The active lifestyle that we had before is over," said Jim Schutte, Carolyn Schutte's husband and now her guardian. "It's gone. We just have to make due with what's left." The couple were once avid travelers. [Media Sept 2006] DID HOLIDAY JABS KILL MY PARTNER? 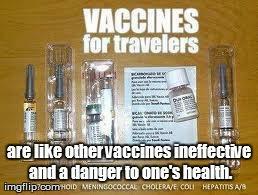 I got some "travel vaccinations" a year ago (typhoid, twinrex Hep A&B, VeroRab Rabies shot 1 & 2, Jap Encephalitis) and I have been quite sick ever since. I'm 34 years old btw and already have Narcolepsy, but now these shots have literally crippled my immune system. Since getting these shots - I seem to be chasing a mystery infection around my body (bronchitis, tonsillitis, laryngitis, Pelvic Inflammatory Disease, etc (with the most serious point a few months ago, where it got into my appendix & bowel and I had to have an emergency appendectomy and have my bowel fixed). Ms E.